Seeing that this is the exact sequence of events that took place then the first few visits to this outlet must be explained as they were on those visits. What I discovered later will be detailed when ‘later’ comes around. Whilst Kawabata was looking to find the owner, I was running by these huge concrete ponds staggered by the colours of the Koi within them. In terms of size this had to be the largest outlet I’d ever visited, there seemed to be ponds everywhere but the state of the place left a lot to be desired. Had it not been for the fact that there were thousands of wonderful Koi in the ponds, one could be forgiven for thinking that the place had long since been left to rack and ruin! Eventually Kawabata came over with a youngish guy and introduced him as Mr. Sakai who owned the place, the guy just nodded to me through a deadpan but inquisitive face. I’ve often wondered since if the guy had ever seen a non-Japanese Koi buyer before I made that visit. Kawabata san asked me to point out to Mr. Sakai some ponds I wished to select from and that was when disbelief and frustration set in with me. ‘TAKAI’ came the reply – I already knew that meant ‘expensive’! Not to worry, I pointed to another pond. ‘TATEGOI’ came the reply – the word I was heartily sick of by then. No problem, I pointed to the next pond. ‘SOLD OUT’ said the man. Lord help me, I’d bought his Koi for peanuts via an auction and paid Kamihata their commission. Now I was standing at that very same breeder’s own place surrounded by thousands of the same Koi with money falling out of my pockets to buy them and the guy didn’t even want to know me! Frustration escalated when Kawabata said that Mr. Sakai suggested we go inside the house for tea? I explained to Kawabata in no uncertain terms that I could drink tea almost anywhere and at any time but I’d flown halfway around the world to find this very place and the last thing I wished to do right then was drink tea! The only thing I wished to do at that moment in time was to buy some Koi! A couple of younger guys came over, presumably his staff and Sakai pointed to a few ponds and gave some instructions. Ten minutes later I was gazing down into a bowl of around fifteen Sanke and Showa around 15” long and there was no question, the Koi were wonderful! Then we kicked off again for the second round of battle. ‘This one’ – I pointed. I came away from Mr. Takai that day with only eight Koi that I’d paid a bloody King’s ransom for. On the way back to Tokyo, I just kept staring at the Polaroid shots and telling myself just how much money I’d lose when I had eventually sold them back home. I shouldn’t have bought them at all and just walked away never to return. Yes, the man’s Koi were wonderful but the place was Steptoe’s scrap yard on a GOOD day. As to the man himself, I could not recall ever seeing a Koi breeder with such an expressionless face in my life. It did come over to me that he really believed he was the ‘Koi Kiddie’ and the ‘BIG I AM’ who had long since overtaken the rest of them. On top of all his wonderful methods of handling customers with great care and attention he was arrogant in his posture and also indicated that I was wasting his valuable time! I didn’t know the guy from Adam apart from a name I’d been given but by the time I returned home I’d already decided he’d never see me again on the next trips. I’d spend my money with those breeders who were human! All the Koi arrived back from the shipment and the guys who worked for me commented as to how wonderful these eight Koi were whilst I just replied – ‘TAKAI’ – they had no idea what I was talking about! I knew what margins I’d have to load on my landed prices and thought it would have to apply to the eight also. I put them all in one small pond without any prices whilst all the others (apart from the larger Koi) were clearly priced. I walked over with my best Mr. Takai expression and explained – ‘Sorry mate, these Koi are expensive’ and walked back towards the office. Then something suddenly struck me……hmm……..why not try the Takai approach? ‘They are all different prices’ I replied, ‘Each one cost me different prices’. ‘So what’s so good about ‘em then’? ‘Why don’t you tell me mate? After all, you’re the one who is asking’. ‘OK then, how much is this one then’? The guy’s eyes widened as I went back to the office to get a list that DIDN’T exist. I came back with the Polaroid of the fish and said ‘Is this the one’? I think the other seven were gone inside seven days and then I got inundated with requests for more!!!! Of course I knew that I’d have to return to ol’ Grumpy Guts again and that wasn’t a pleasant thought. In autumn ’82, spring ’83 and autumn ’83 I returned and I think it was the autumn ’83 trip that his face indicated that he nearly remembered me for the very first time. Please bear in mind, in those days it was unheard of for foriegners to actually visit Japan to select and buy Koi. The ones that did go to export markets were handled by brokers and shipping companies usually based in Tokyo, Chiba and later Narita. The guys running these companies did not take too kindly to the breeders allowing foreigners to bypass their mark-ups. In truth they did everything possible to make things difficult by keeping ‘Koi Japan’ a very firmly closed shop. With each trip I managed to buy a greater number of Koi but it wasn’t exactly easy, back in the UK they continued to sell as easily as before. I gave them the name of ‘Sakai Sankes’ and ‘Sakai Showas’ because it was far too hard to get the buyers to say Matsunosuke. I learned something of value on all those visits but I can’t recall exactly which trip I learned them on. Here’s what I picked up as a result of MY questions to Mr. Takai translated by Megumi (‘Menchan’) Yoshida. The man himself has never been ‘forthcoming’ with his desire to dish out information and any that he does give has to be squeezed out of him with endless questions – thankfully I’m persistent. It turned out that he was the younger brother of the guy that owned Yamamatsu in Mushigame village where he’d been raised. His name was Toshio Sakai and his elder brother was Toshiyuke Sakai. Toshio knew at an early age that the Yamamatsu business would be handed over to Toshiyuke once his father passed on, so Toshio knew he’d have to move away or become a permanent ‘second in command’ at Yamamatsu for the rest of his life. In 1967, at 21 years old he took a train to Isawa in Yamanashi Ken to check out the ground conditions as well as the temperature conditions of the water there. The climate was much warmer than Niigata and some of the land would hold water. One year later he moved down to Isawa after landing a job as a noodle chef by day and a bartender at night where he was allowed to sleep after the last customers had left. Toshio saved the money he earned and together with a loan from his father managed to scrape enough together to put a deposit on a large area of waste ground near the centre of Isawa town. Whilst still working at both jobs he had met labourers from other countries who were employed on a casual basis as builders although it was frowned upon. When these guys had little work, Toshio paid them to machine excavate part of the land (over the road from where he would eventually build his house and farm) and make four large mud ponds there. Unfortunately the ground did not hold water and so rubber liners were used to retain the pond water. His next task was to get his father to keep all the third culls (August selection) of tosai production each year instead of throwing them away, and Toshio would collect them and bring them to Isawa to place them in his four outdoor ponds. 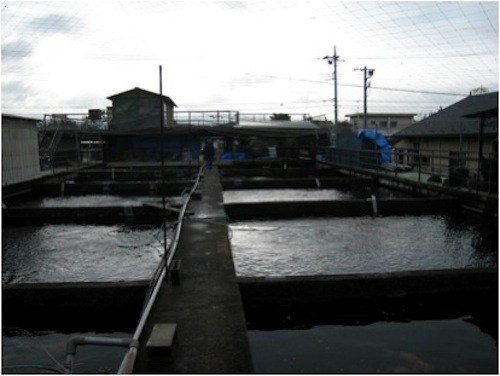 Isawa water temperatures in August are high but the water in the area contains very high quantities of natural spirulina. The bedrock underground is rich in hot mineral springs, which could be used freely to heat the growing ponds. 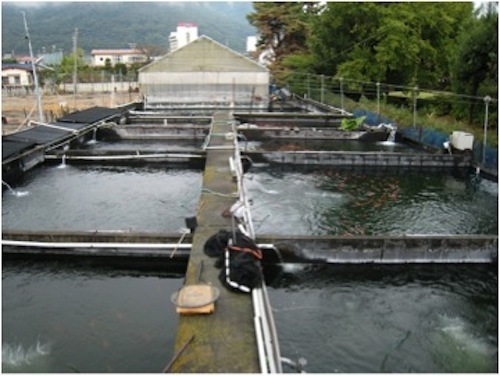 Toshio supplemented feeding with cheap colour enhanced feeds and produced MANY thousands of large tosai with a pigmentation never really witnessed before in those days. 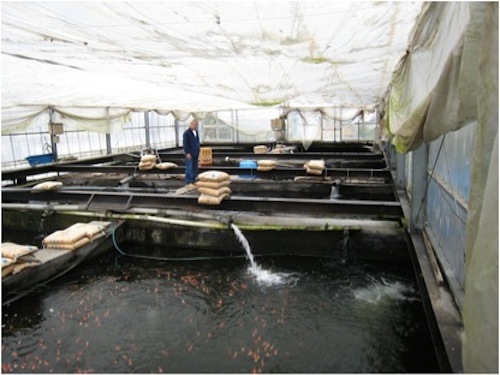 He’d send these Koi by road carrier to every Koi auction site all over Japan and just wait for the payments to come back – he’d discovered his own way to print money for very little outlay! It wasn’t only Waddy who’d been taken in with these pretty and vivid reds, blacks and whites – these were also sold by the bucket load to all parts of Japan. The next season he asked his father to save his second cull (July selection) which gave him 20 times the quantity he had in the first year. Of course the patterns suffered but the pigmentation was equal and Toshio was racing! By 1972 he’d paid back his father, he’d paid back the mortgage on the land and he then took a bank loan to build his house and ponds at The Isawa Nishikigoi Center. In 1974 he returned to Mushigame and proposed to his childhood sweetheart, they were married in Mushigame and returned to live in Isawa but tateshita were no longer in Toshio’s dreams any longer. By then, Toshio’s dreams were to set the Koi world on FIRE! Of course, there’s MUCH more – this up to now is only the tip of the iceberg!